Picture an escalator. Some people stand still, others power-walk. Parents hold children’s hands. Some people barely break stride as they board, others hesitate and wait for just the right moment. Typically, the biggest concern is an out-of-service flight that turns would-be-riders into climbers. However, as we were reminded this week, escalator accidents are a very real danger and can have life-altering or even life-ending consequences. 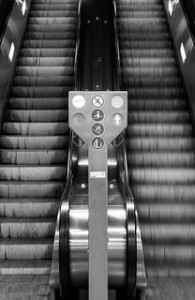 When people are injured or killed due to an escalator accident in Northern California, our San Francisco injury lawyer is prepared to fight for their legal rights and the compensation they deserve. At the time of this writing, few details had emerged about a Sunday afternoon escalator accident at the Powell BART station. ABC7 reports that a man fell backwards into four women when an escalator stopped abruptly between the platform and the concourse. Four people received treatment for minor injuries. A sampling of news reports from 2014 and 2015 vividly demonstrate that escalator accidents can have much more dire consequences. Last month, a 3 year old boy suffered a foot injury when his boot became trapped in a step aboard a Burger King escalator in Wel lington, New Zealand (The Dominion Post). Also in June, a toddler lost his hand when it became stuck in a gap while playing aboard an escalator in a Kuala Lampur train station (AsiaOne) and a boy in India lost three fingers when, while riding a mall escalator with his parents, he fell and his hand became stuck near where the escalator meets the floor (Times of India). In April, a five year old girl died at a mall in Kuala Lampur after slipping through a gap between an escalator and rail (The Star). Children are not the only escalator accident victims. Last week, Australian sports news site AFL.com reported that a man was in serious but stable condition after falling from a crowded escalator. October 2014 saw at least two adult escalator fatalities. One woman fell to her death while apparently playing around and straddling the rail after a hockey victory in St. Louis (Stltoday.com). Another woman was strangled when first her scarf and then her hair became caught in a Montreal transit station escalator (CBC News). Escalator accidents are surprisingly common. According to a 2013 research report titled “Riding the Escalator: How Dangerous is it Really?” (available via Medscape), there are approximately 10,000 escalator-injuries each year in the United States that result in emergency room treatment, a number that has been steadily rising since the 1990s. Researchers reviewed incidents involving 173 patients over age 16 admitted to one Swiss hospital following escalator accidents. There were two fatalities, one suffered a cardiac event before the accident and one incurred intracranial bleeding as a result of the escalator accident. About half of the patients received only conservative treatments and half required hospital admission, with 55% of the admitted patients staying for more than 24 hours. Public transit facilities (62%) and shopping centers (30%) saw the vast majority of the injuries reviewed in the study. Patients were pretty evenly split by gender, but women tended to suffer lower extremity injuries while men tended to experience head/neck injuries. Interestingly, half of injured men but only 7% of injured women were intoxicated at the time of injury. Researchers noted that people over age 60 were hurt at a disproportionate rate. While the 2013 report focused on adults, a 2006 study in the journal Pediatrics found, unsurprisingly, children under age 5 are disproportionately hurt in escalator accidents. True accidents do occur, but often investigation reveals someone (or some entity) was at fault. In some cases, a defect in the escalator’s design (ex. an unsafe gap between the steps and the rail) is to blame. Other cases involve an installation/maintenance defect (ex. loose connections or aging wires cause electrical malfunction). The facility where the accident occurred may bear some of the blame as may companies involved in building and maintaining the escalator. Another individual may also bear some of the fault, perhaps maliciously pushing someone down the escalator or causing a chain-reaction injury by failing to pay attention and stumbling at the end of the flight. As in other accident cases, the principle of comparative fault is realistic and means people can recover even if they played a role in causing the accident (ex. a distracted person trips and her shoelace becomes caught in a stair). If you or someone you love has been injured in an escalator accident in San Francisco or the surrounding region, you may be entitled to compensation. Attorney Brod offers a no-cost consultation at the offices of our injury law firm in San Francisco, Oakland, or Santa Rosa. If circumstances require, we can also come to you or schedule a telephone meeting.